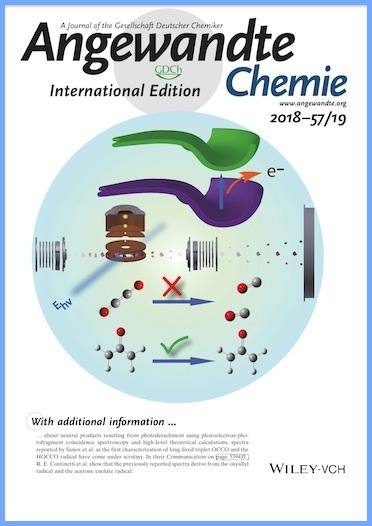 This paper published in Angewandte is about neutral products resulting from photodetachment using photoelectron-photofragment coincidence spectroscopy and high-level theoretical calculations. The spectra reported by Sanov et al. as the first characterization of long-lived triplet OCCO and the HOCCO radical have come under scrutiny. In the Communication on page 5394 ff., R. E. Continetti et al. show that the previously reported spectra derive from the oxyallyl radical and the acetone enolate radical. Our research focuses on experimental studies of transient species in the gas phase, with a scope of interest ranging from isolated small radicals and ions to mass-selected nanoparticles and aerosols. To carry out this experimental program, we design and construct coincidence spectrometers, ion trapping devices and novel mass spectrometers. Photoelectron and photofragment spectroscopies, three-dimensional imaging techniques and time-of-flight and charge detection mass spectrometric techniques are all brought to bear in studying the structure, energetics and dynamics of these transient forms of matter. Our reaction dynamics experiments employ photoelectron-photofragment coincidence spectroscopy in fast ion beams to study dissociative photodetachment, three-body dissociation dynamics, energetics, and photodissociation of anions. On machine C we are now carrying out these studies using an electrostatic ion beam trap (EIBT). Some of our most important recent results include characterization of the tunneling dynamics of the HOCO radical and the OH + CO → H + CO2 reaction, and our recent results, noted above, on the F + H2O → HF + OH reaction. We have recently coupled a radio frequency (RF) cryogenic octopole accmulation trap (COAT) with our source in order to cool precursor anions to their vibrational ground state. Machine A couples an electrospray ionization source, with a photoelectron-photofragment coincident spectrometer to allow the dissociation dynamics of large, or multiply charged anions, to be studied. Current work focuses on the dissociation dynamics of the singly and doubly charged dicarboxylic acids. The machine has been recently rebuilt and now includes a hexapole accumulator trap and a 10-stage electrostatic linear accelerator to produce intense bursts of fast anions. The Aerosol Impact Spectrometer (AIS) is a custom-built spectrometer designed to study the collision dynamics of single mass- and charge-selected aerosols and nanoparticles using hypervelocity impacts on inert surfaces. Measurements from the apparatus allow the characterization of phase and energy dependent impact dynamics for a wide variety of particle species. The AIS consists of a source of charged nanoparticles or aerosols to generate species of interest, a nanoparticle electrostatic trap to collect spectrometric information for the particles generated, a linear accelerator/decelerator to adjust particle energies, and a flexible detection set-up to investigate different types of impact phenomenon. Sea Spray Aerosols, which are particles generated from ocean waves, are complex mixtures of chemical components such as inorganic salts, fatty acids, and polysaccharides and have a profound impact on the weather and climate. We conduct laboratory experiments on sea spray aerosol model systems to gain insight into their structure and reactivity when subject to controlled conditions. A new electrodynamic balance apparatus developed in the Continetti Lab spectroscopically analyzes single trapped aerosols in controlled humidity and temperature chamber. We aim to study water diffusion, ice formation, and water uptake as a function of chemical composition.